Again, there are huge holes in this story. First, the allegation occurred 30-plus years ago. Second, take a look this phrase: “After six days of carefully assessing her memories…” that’s certainly interesting. Add this to the fact that multiple people have refuted the accusation, and she only remembered this particular incident after Brett Kavanaugh was nominated for the Supreme Court—this is another suspect story dropped at the last-minute. Like the previous allegation lobbed against the judge by Christine Blasey Ford, in which she alleges a drunken 17-year-old Kavanaugh tried to sexually assault her at a party in high school, there is zero evidence. Both allegations are unprovable. Both are too old to truly be vetted. Both are not federal crimes, so the FBI can’t really step in here no matter how loud the Democratic cries become. Again, lets recap how we got here. Democrats were freaking out that Justice Anthony Kennedy was retiring. Trump picks another nominee; Democrats are still fuming over the GP blocking Merrick Garland. Brett Kavanaugh is nominated, his hearings, while intense at times, go through, his confirmation is almost a guarantee, and then we have these zero hour sexual misconduct. It’s too good to be true. Why weren’t these allegations unearthed during the hearings or prior to them? Ramirez’s story is new, but Sen. Dianne Feinstein (D-CA) knew about Ford for weeks. Her office received her letter detailing the allegation back in July. She sat on it, didn’t tell her Senate colleagues, and only turned it over to the DOJ days before what would have been the Senate Judiciary Committee’s vote on Kavanaugh. Ford also has witnesses that don’t recollect the incident, refuting her account. She can’t remember how this party came about, how she got there, or who owned the house. Key details are missing. In the meantime, prior to this story dropping like an A-bomb, she retained the Debra Katz, an unabashed anti-Trump lawyer (and Democratic operative) and took a polygraph administered by an anonymous former FBI agent, yet she wanted to remain anonymous. No, these aren’t the actions of someone wanting to be anonymous; they’re ones taken for someone to eventually go public. Ford is also a Democrat. Both women have unverifiable allegations. Maybe that’s why Feinstein sat on them. There’s no way to be fair with these stories to both parties. Also, Feinstein herself stepped on a rake by suggesting that Ford’s allegation might not be true. As I’ve said before, this has all the makings of a political hit job of the vilest kind. Democrats are using unprovable allegations to delay the process. You saw that when Ford was dragging her feet on whether to testify after the GOP offered both a public and private hearing, with the option of staffers heading to her home to record her testimony. The Left knows this will build pressure on Republicans. They know it will fan the anti-Trump flames of their base before the 2018 midterms. They want to use it to destroy an eminently qualified judge, who they hate—and they hated how everyone was saying he was a decent, honorable, loving family man. Republicans cannot be those things in the eyes of Democrats. In today’s world, you no longer need bullets to assassinate leaders. His character is trashed, his nomination is derailed, and Democrats increase their political position on the Hill after November. You gotta give the Left credit—and I don’t mean that in a good way. This ploy is nasty. And it shows what lengths they will go to avoid losing power, along with their affinity for abortion. Remember they really fear Kavanaugh will be the key vote to overturn Roe, among other things. On top of this, they want an FBI investigation. Remember, it’s a game of running out the clock, but using the FBI to help them execute their hit on Kavanaugh is deplorable. It’s nonsense—and yet, these are the folks who clamor about how institutional integrity s being degraded under Trump. Maybe it is—they’re doing it. With Democrats calling to postpone the Kavanaugh nomination over these new allegations, is Ms. Ford kicked to the curb? I thought they wanted to hear her story. Apparently not, it’s all about stopping Kavanaugh. They don’t care if it’s true. And as for due process, some Democrats on the committee think that the judge’s legal philosophy pretty much means he’s guilty of sexual misconduct. Also, conservative judges are not afforded the right to due process. It’s quite the position. Senate Judiciary Committee chair Chuck Grassley (R-IA) already postponed the committee vote on the nomination. But we all see the playbook here. This looks awfully like a politically motivated hit job, and it probably is. The Democrats know what’s at stake. So do Republicans, but only one side is acting like it. Until Trump leaves office, the GOP has to be on a war footing. This is wartime. It’s time to be nasty, get nasty, and throw haymakers. Screw civility because you shall receive none from the Left. Screw mercy, again, because you shall receive none. The Democratic Party is the enemy. Act like it! They’re running a blitz. It’s time the GOP to burn them down field. Senate Republicans must not allow unsubstantiated and discredited allegations from over three decades ago to destroy the life and reputation of a good man. 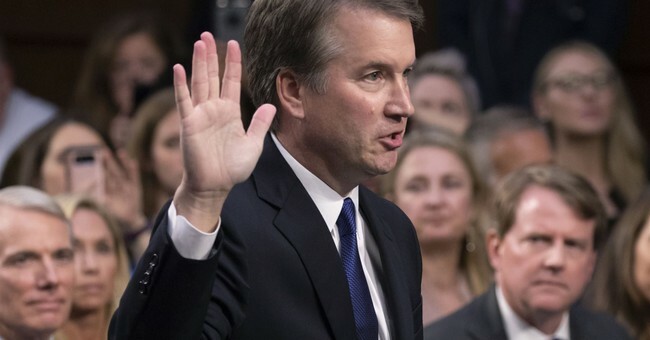 Countless people from every phase of Brett Kavanaugh's life have testified that he is a good man of the highest character and integrity. Chuck Schumer vowed to oppose Kavanaugh with everything he's got, and apparently that took the form of character assassination. This has all of the ingredients of a smear campaign on steroids. Senate Republicans should stand up to these unsubstantiated and discredited allegations and move forward with a vote to confirm Kavanaugh."